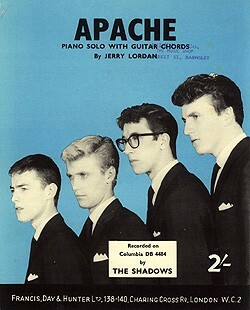 By 1963 the work of The Shadows evidently meant something to their American cousins (see on  ‘Blue Star’;  ‘The Savage’), but The Ventures’ treatment of ‘Apache’, produced for an album devoted to high fliers in the instrumental galaxy (‘Red River Rock’, ‘Let There Be Drums’ etc. ), is stylistically worlds apart from the UK group’s moody-sounding masterpiece, which The Ventures had not heard. Their ‘Apache’ recalls rather the Jorgen Ingmann version so alluring to the American market. 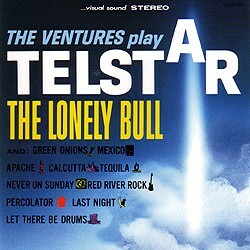 This was more of a novelty piece really, decked out as it was with the contrived mimicry of whistling arrows reminiscent of a turkey in heat – an ingredient recurrent to varying degrees (ranging from fairly muted to downright intrusive and irritating) in subsequent Ventures renditions, both in the studio, from the 1963 debut through to the beefed-up remake, as unappetising as ever, for M&I Japan (V-Gold 1999); and in concert as well, the number becoming a stage-favourite early on. Still, to judge by the live recordings, Japanese audiences took delight in such effects.